The Sault Ste. Marie region is one such place that still speaks to our hearts. Sandy beaches and rocky coastlines lead to picturesque lighthouses, and engineering feats of man stand side-by-side with small fishing skiffs and buckets of bait. 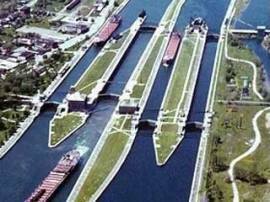 One great attraction is the Soo Locks. They have been referred to as one of the great wonders of the world and are still the largest (& one of the busiest) waterway traffic systems on earth! Watching huge vessels pass through the Locks is a unique experience that cannot be seen anywhere else in the United States! Whether for a weekend or a lifetime, come to Sault Ste. Marie, and let yourself step back and step closer—to your friends, to your family and even to yourself. You will be amazed at what you find in this wondrous part of the world.